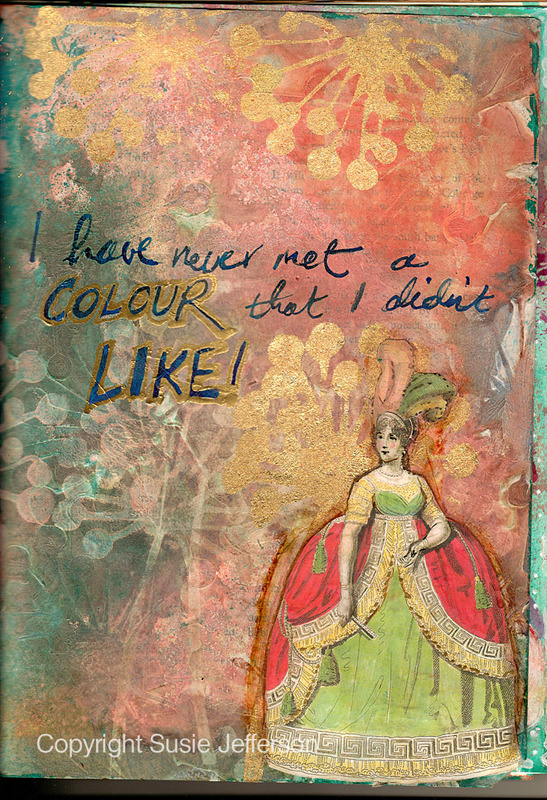 I've been so busy that I haven't had time to create something specially for Pink Saturday, so here's a journal page - which does have pink in it, plus a lot of other colours! 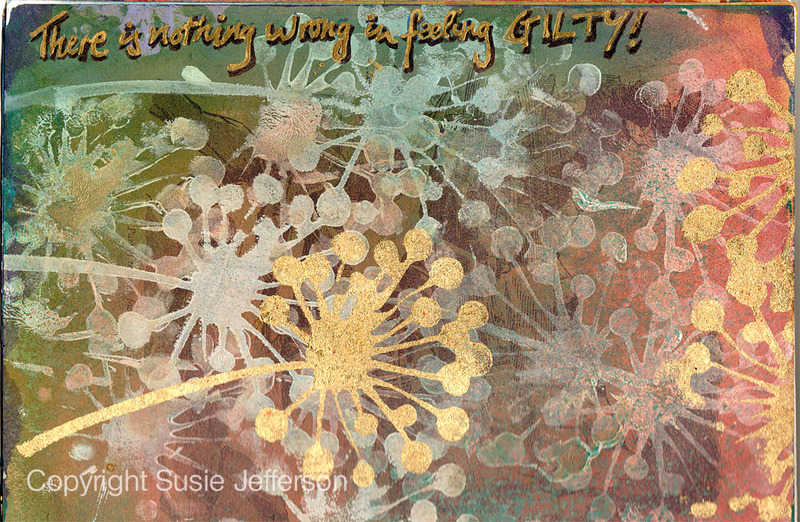 Side view, showing the Feeling Gilty titling - written with a metallic pen and black drop shadowing. I'm calling it Feeling Gilty (referencing the gold foiling and the gold lettering) and can truthfully say there isn't a colour that I don't like. Yes, there is also pink on this page! Titling written with India ink and a dip pen. Although I did have a problem with pink at first, as it's right out of my comfort zone. Which you'll have noticed I have now got over, lol. This is so rich looking with nice depth of color. The muted background makes the gold really pop. Sending you sunshine from Seattle! what a gorgeous creation. I've been feeling guilty lately too. Pink Saturday rolls around and I remember that I haven't any pink to share. It's been very hot here in the States, that rainy and cold day sound heaven to me. I'll have a cup of tea please. I don't know if my first comment went thru. So, I'll try again. I love your creation, it's beautiful. Journal pages really speak to my heart. I've been feeling guilty too, Saturday rolls around and I remember I haven't any pink to share. Your cold and rainy days sounds pretty good to me. It's been quite hot in the States. How about a cup of tea by the fire? Thank you so much for stopping by and Happy Pink Saturday! 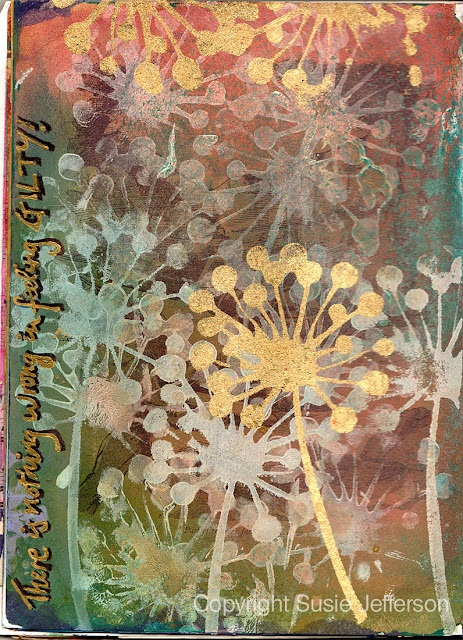 I love your journal pages, so pretty:) We could certainly use some of your rain here! Susie, what a delightful journal page; a wonderful creative success out of your comfort zone. Cool sounds so nice right now. I guess everything is relative. You are very talented and it definitely shows in your work. That is pretty creative and I like what you called it too. Glad you stopped by and left your nice comment. 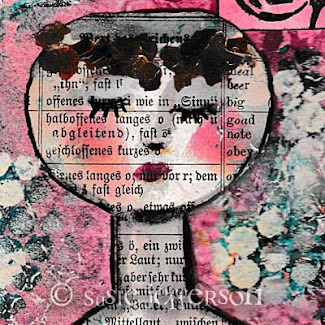 Happy Pinks and enjoy your weekend. Lovely and pink journal cover! I love journals too. Thank you for coming by my blog and for the sweet comment..yeah, I hope you get the steamer, it's fun, easy and quick too. I art journal too and really loved your page - the mists and dyes are so much fun to use! 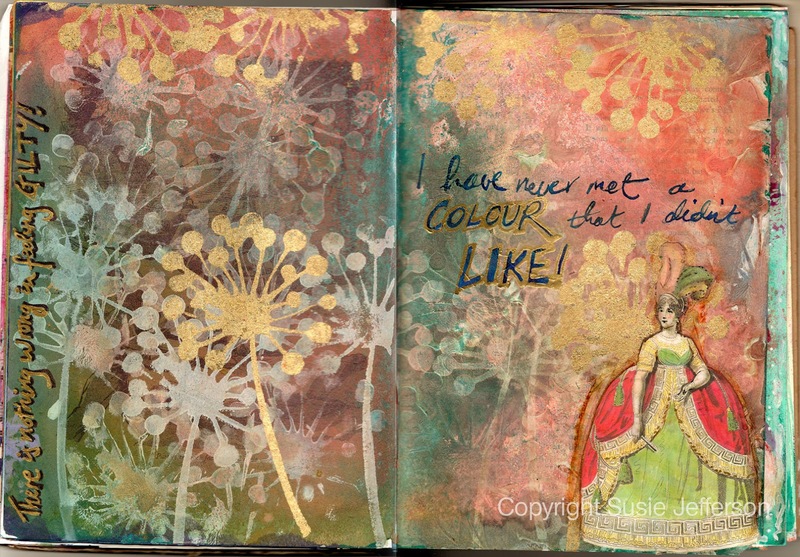 Have you ever considered an art journal page swap? Hope you have a fun Pink Saturday! WOW. Your pages are stunning!!. Whimsical, even :). The stamping & gilty work are fabulous. LOVE the subtle colors here. Thanks so much for your sweet comments in my blog :). Hugs. Just stunning work! I'm so glad I found you, you're full of inspiration for a newly converted are journaler...I'm a new follower now. 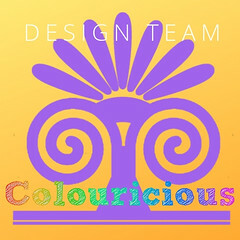 Thank you for your comments on my blog.... a good occasion for me to discover yours. This page is a pure sweetness for my eyes. Hi Sue - I'd be delighted to visit, but can't find a link. Clicking your name takes me to your Google+ page, but no details re your blog! Thank you all so much for your lovely comments, and to all my new followers! I'm thrilled and honoured!